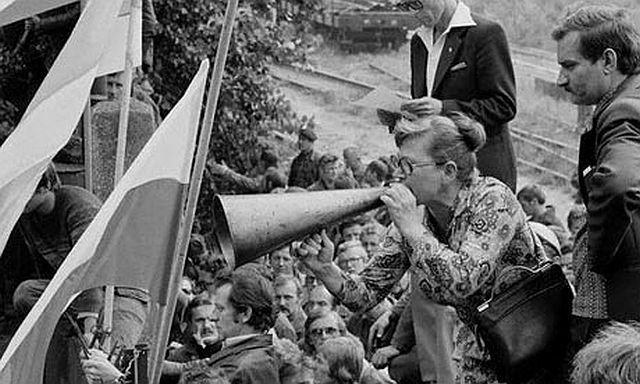 Anna Walentynowicz, who has died in today’s terrible plane crash over the forests of Katyn, was the Polish trade union activist whose sacking in August 1980 was the spark that led to the strike in the Gdansk shipyard that paralysed the Baltic coast and the birth of Solidarity, of which she became a prominent member. Throughout her life, Anna worked at the Lenin Shipyard in Gdansk. She began work there in 1950, as a welder in the Rosa Luxemburg Brigade. She complained that women weren’t receiving the same production bonuses as the men. Later she was a crane operator. As a young woman, she joined the Communist Party, but soon became aware of corruption and witnessed the suppression of free speech and the rights of workers to organize. Disillusioned, she quickly became maligned by the party, as she began to campaign for justice after discovering one of the Communist Party bosses at the shipyard was stealing money from the workers to take part in a lottery. She was a member of the Free Trade Unions of the Coast in the late 1970s, and editor of Robotnik Wybrzeza, an illegal newspaper which she distributed at the shipyard. Anna was fired on August 7th 1980, only months before her retirement. Activists quickly organized and condemned the sacking, distributing leaflets which called for collective action. Within a week, the shipyard workers were on strike. First on the list of demands presented by Lech Walesa was Anna’s reappointment. 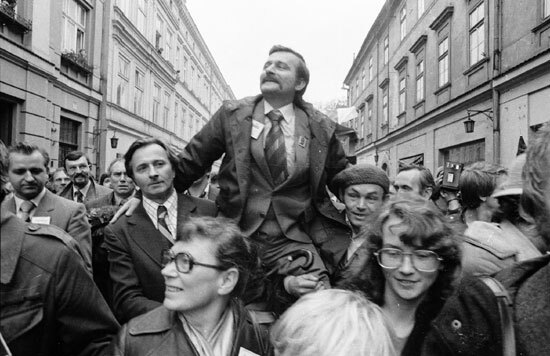 Walesa called an end to the shipyard strike on August 16, 1980, after management agreed to re-employ fired workers and raise wages. Walentynowicz opposed this move, demanding that protests should continue until all workers’ concerns were addressed. Divisions between Walesa and Walentynowicz continued for many years. An agreement was signed on 31 August 1980, which gave workers the right to form trade unions and that September the Solidarity party was formed. Today, the mayor of Gdansk, Pawel Adamowicz was quoted as saying that Walentynowicz fought for equality, human dignity and truth. He said she criticized Polish society after the communist regime was abolished in 1989, because the change didn’t bring well-being to everyone. On May 3, 2006, President Lech Kaczyński, who also died in the crash, bestowed upon her the Order of the White Eagle, Poland’s highest honour. Anna appeared as herself in the film Man of Iron, directed by Andrzej Wajda, who coincidentally also directed the recent film about the Katyn massacre. All on board today’s flight were travelling to Smolensk to attend the 70th anniversary of the Katyn massacre, where Soviet secret police executed 15,000 Polish officers in the Second World War. The plane went down in the same area, making the most extraordinary timing and location for the tragedy. In 1990 Russia accepted responsibility for the 1940 executions of imprisoned Polish officers in the Katyn forest, a massacre the Soviets had previously blamed on the Nazis. Previously, the Russian government had maintained that the Nazi regime was responsible. About 8,000 were officers taken prisoner during the 1939 Soviet invasion of Poland, the rest being Poles arrested for allegedly being intelligence agents, gendarmes, saboteurs, landowners, factory owners, lawyers, priests, and officials. Since Poland’s conscription system required every unexempted university graduate to become a reserve officer, the Soviets were able to round up much of the Polish intelligentsia, and the Jewish, Russian, Ukrainian, Georgian and Belarusian intelligentsia of Polish citizenship [Wikipedia, sources cited].